Comparing young versus old The most common application of microarrays to aging-related research is an experimental design that compares gene expression in young organisms to gene expression in old organisms. Studies of this type have been carried out in all of the major model systems, as well as in humans (Hudson et al., 2005). Most often, the goal of this type of study is to identify genes for which transcription either increases or decreases as a function of age, in other words, biomarkers of age. It is important to recognize that the gene expression changes observed from this type of design don't confer any information about genes that determine longevity or rate of aging. Also, as is true of any microarray experimental design, the observed gene expression changes can be stated to correlate with the condition being studied (biological age, in this case), but no information is obtained regarding whether the gene products themselves play a causal role. An important question when designing an experiment of this type is how to define the ''young'' and ''old'' populations. There is no single ''correct'' answer to this question; however, there are several considerations that should be taken into account. Without exception, two age-point designs (one young and one aged) are less favorable than multiple age-point designs where gene expression profiles are obtained at several different ages. As a rule of thumb, experiments of this type should examine the maximum number of different age-points possible while still maintaining sufficient replication at each age-point for meaningful statistical analysis. The importance of appropriate timing and spacing of age-points in the interpretation of gene expression studies should not be underestimated. Data regarding the kinetics of age-associated gene expression changes can provide valuable information for developing hypotheses regarding the functional consequences of the observed changes. In addition, both the structure and interpretation of the data may differ substantially depending on the number and spacing of age-points and the type of gene expression changes that occur (Figure 10.1). In most cases, it will be desirable that animals are reproductively and developmentally mature at the youngest age-point. In order to define the oldest age-point, statistical parameters of the population life span can be used as a guideline. For example, an old age-point could be defined as 50% or 75% of the median longevity. It must be kept in mind, however, that the older an animal is at the latest age-point, the more likely that age-associated degenerative changes will obscure the relevant age-associated gene expression changes. A majority of the published microarray studies examining age-correlated gene expression suffer from an inadequate number of age-points (Melov and Hubbard, 2004), a fact that must be considered when analyzing and interpreting these data. Nonetheless, some interesting trends have been observed in multiple studies across a variety of species. For example, up-regulation of genes involved in the response to oxidative stress and other types of stress seems to be a common theme in aged invertebrates (Landis et al., 2004; Pletcher et al., 2002; Zou et al., 2000) and mammals (Kayo et al., 2001; Weindruch et al., 2001). This is consistent with the idea that oxidative damage increases during aging, and is interesting in light of the observations that some long-lived mutants show increased expression of oxidative stress response genes as well as increased oxidative stress resistance as young animals (McElwee et al., 2003; Murphy et al., 2003). Figure 10.1 Importance of age-points in microarray analyses of aging. 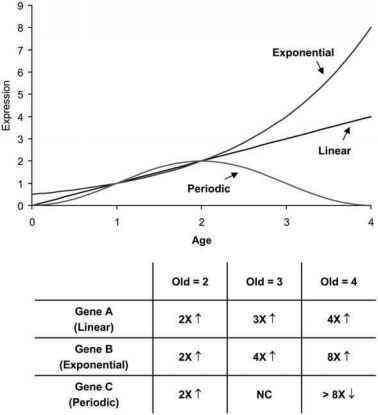 Age-related gene expression is shown for three hypothetical genes: expression of Gene A increases linearly with age; expression of Gene B increases exponentially with age; Gene C shows a periodic expression pattern, where expression increases at young age, then decreases during old age. For a two age-point design (one "young" and one "old") specifying age-point 1 as the young age-point, different conclusions are reached depending on which age-point is used as the old age-point. If age-point 2 is used, all three genes show the same 2-fold increase in expression. If age-point 3 is used, genes A and B both appear to be up-regulated, while gene C shows no age-associated change (NC) in expression. If age-point 4 is used, gene A appears to be up-regulated by 4-fold, gene B is dramatically up-regulated by 8-fold, and gene C is down-regulated by more than 8-fold with age. The only design that provides an accurate picture of the (relatively simple) age-associated gene expression kinetics for these genes employs at least 3 age-points. however, there are no short-lived mutants that recapitulate all aspects of normal aging, and it is extremely difficult to differentiate premature aging from nonspecific deleterious effects. Several studies have reported gene expression profiles corresponding to long-lived mammalian models, as a result of environmental changes such as calorie restriction (CR) (Park and Prolla, 2005b), as well as longevity-enhancing mutations, such as the Ames dwarf, the growth hormone receptor knock-out (GHR-KO) (Dozmorov et al., 2001; Miller et al., 2002; Tsuchiya et al., 2004), and the fat-specific insulin receptor knock-out (FIRKO) (Bluher et al., 2004). In C. elegans, the transcriptional changes associated with longevity-determining mutations in the insulin-like/IFG-1 pathway have been well characterized by microarray, resulting in the identification of several previously unknown aging genes (McElwee et al., 2003; Murphy et al., 2003). One popular design for microarray studies of aging combines both a longevity component and an age component. This approach allows for the identification of several classes of gene expression biomarkers that would otherwise be obscured (Hudson et al., 2005). A classic study of this type (Lee et al., 1999) compared the gene expression profile in gastrocnemius muscle from young and old mice, either fed ad libetum or calorie restricted, and reported that many of the age-correlated gene expression changes are attenuated by CR. While the limitations of this study (small number of replicates and no statistical analysis) have been amply documented (Melov and Hubbard, 2004; Miller et al., 2001), this represents the basic design strategy for all microarray studies of this type. Subsequent studies have validated the idea that CR retards age-associated gene expression changes in a variety of tissues (Park and Prolla, 2005a) and have begun to address the question of determining which CR-induced changes in mRNA might be relevant for increased life span (see Biomarkers of calorie restriction). Biomarkers of calorie restriction An important class of longevity biomarkers consists of biomarkers of CR. The discovery of CR mimetics—drugs that recapitulate the longevity benefits of CR without necessarily requiring a decrease in nutrient consumption—has obvious applications to human health. One approach that might be taken to identify CR mimetics is to use microarrays to define a pattern of gene expression changes that is characteristic of the calorie-restricted state. Animals can then be fed a putative CR mimetic and the corresponding effect on gene expression assayed. The higher the similarity between gene expression associated with CR and the observed gene expression profile, the greater the likelihood the compound will have a beneficial effect on longevity, at least in theory. Although yet to be proven, this approach is appealing because it does not require the time and expense of life-span assays—a limiting factor in mammalian aging studies—for each compound. Gene expression biomarkers of CR have begun to be used to address important questions regarding the mechanism and temporal kinetics of CR. Dhahbi and colleagues used microarrays to compare the changes in hepatic gene expression of young and old mice in response to CR after 2, 4, and 8 weeks (Dhahbi et al., 2004). The striking result of this study is that old mice switched to CR late in life showed a rapid shift toward the gene expression profile of animals subjected to long-term CR, while old mice switched from a long-term CR diet to a control diet showed a corresponding shift in gene expression profile toward animals maintained on a control diet for their entire life. These data are consistent with evidence from both mice (Dhahbi et al., 2004) and flies (Mair et al., 2003) that CR initiated late in life reduces mortality to a comparable extent as life-long CR, and suggests that at least some of the observed gene expression changes correlate well with the ability of CR to slow aging. Gene expression meta-analyses As the number of aging-related microarray studies increases, the opportunity presents itself to carry out bioinformatic comparisons between multiple organisms or multiple models of enhanced longevity. In the first such meta-analysis of aging, gene expression changes correlated with age were compared between worms and flies (McCarroll et al., 2004). A phylogenetic analysis was used to first identify orthologous gene pairs for which the pattern of expression change with age has been reported from prior work. From this analysis, the authors define a ''shared transcriptional profile of aging'' involving genes involved in a variety of processes, including mitochondrial metabolism, DNA repair, catabolism, peptidolysis and cellular transport. As with many of the microarray studies already described, valid criticisms of the statistical methods employed in this meta-analysis have been raised (Melov and Hubbard, 2004), and it remains to be seen how much of the shared profile of aging is conserved in mammals. Nonetheless, this represents an important step forward in the application of bioinformatics to aging-related data sets. At this writing, no large-scale meta-analysis of multiple models of enhanced longevity has been reported. An initial foray in this direction has been carried out by Miller and colleagues who have compared gene expression patterns in two long-lived mouse models, the GHR-KO and Snell dwarf, with CR (Miller et al., 2002). More recently, a comparative analysis of longevity versus microarray and other data for 22 lines of inbred recombinant mice was reported (de Haan and Williams, 2005). As global gene expression profiles are generated for additional longevity models and bioinfor-matic approaches to analyzing microarray data improve, more opportunities to carry out meaningful comparative analyses of this sort will arise.